As of now, Scarlett Johansson has played Natasha Romanov, aka Black Widow, in five Marvel Studios movies, and with each one the call from fans for her own solo film has grown more and more adamant. Now Johansson herself has thrown her hat into the ring, telling Variety that her character could indeed warrant her own big screen adventure. 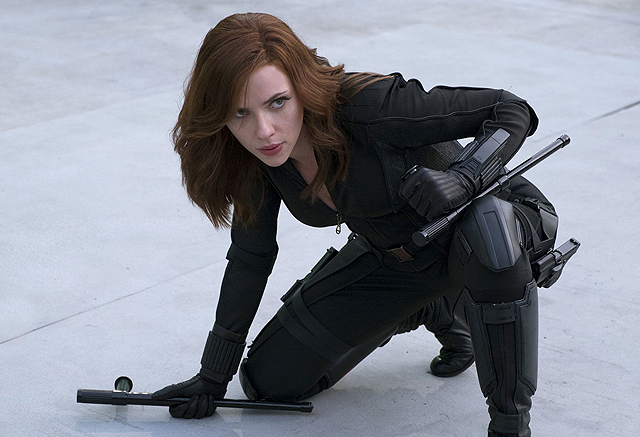 Since any Black Widow movie would have its foot more in the world of espionage than superheroics, there’s a possibility it could be done on a lower budget than the typical $150+ million Marvel joint, with Deadpool being a recent example of a cost-conscious comic book movie. If the studio wanted to go bigger, it could build a story into a Mission: Impossible-style mega action flick, although Widow’s mysterious backstory would be ideal fodder for a prequel, which could still involve characters like a pre-Avengers Hawkeye and a still-brainwashed Winter Soldier. Marvel Studios president Kevin Feige previously stated to Deadline that the studio is “committed” to making a solo film for the character in the future. Marvel Studios currently has only one female-led feature on their schedule, Captain Marvel, which is set for release March 8, 2019, though the upcoming Ant-Man sequel will be a co-headliner titled Ant-Man and The Wasp, set to debut July 6, 2018. There are three Marvel Studios movies without titles set for release in 2020 on May 1, July 10, and November 6, respectively; though it remains to be seen if any of them will be a Black Widow movie.